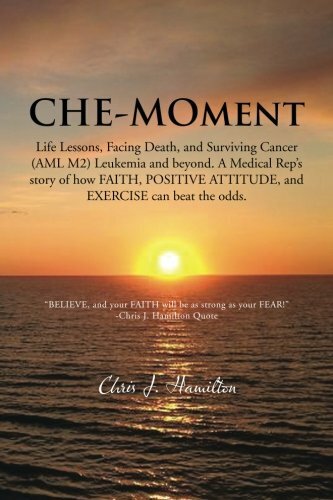 In his book, CHE-MOment, Chris J. Hamilton tells his story battling four different types of cancer, including AML M2 Leukemia. This book was written to guide not only cancer patients and their families through this challenging experience, but also to serve as an uplifting, real-life perspective when life throws curve balls. The book’s title refers to the author’s key moments that changed his life, faith and attitude forever. Hamilton was working in the medical industry when he found out he had throat and thyroid cancer. While undergoing treatments for several months in 2011, he next learned that he had acute myeloid leukemia extending his treatments two more years; including a necessary and risky stem cell transplant. “I took out 90% of the pain because I wanted to keep the book motivational,” says Hamilton. The book engages, educates the reader and includes a medical terminology section to define difficult cancer terms. CHE-MOment includes a few of Hamilton’s blog entries and his take on fighting the illness through diet, exercise, and attitude. CHE-MOment is available on the following websites; AuthorHouse, Amazon, Barnes and Noble, Google Books, Books-A-Million, ebay Books, The Book Depository, Kobo Books and in select bookstores. Chris J Hamilton was born and raised in Boynton Beach, Florida and currently lives in Southern Pines, NC. He graduated from Florida Atlantic University with a Bachelor’s in Business Administration with a major of International Marketing. He worked for medical companies such as Johnson & Johnson and Covidien. He is a four-time cancer survivor including AML M2 Leukemia. CHE-MOment came to him as a way to “pay it forward.” His main goal is to reach as many cancer patients as he can, so he can make a difference in their lives. A portion of the proceeds from the book will go to the FirstHealth Cancer Care Fund. For more information, please visit http://che-moment.com/. For more information on the FirstHealth Cancer Care Fund and how to donate, visit www.NCCancerCare.org. Hear Chris’s inspiring story at National Cancer Survivors Day on May 29 at FirstHealth Moore Regional Hospital. For more information, visit www.NCCancerCare.org.